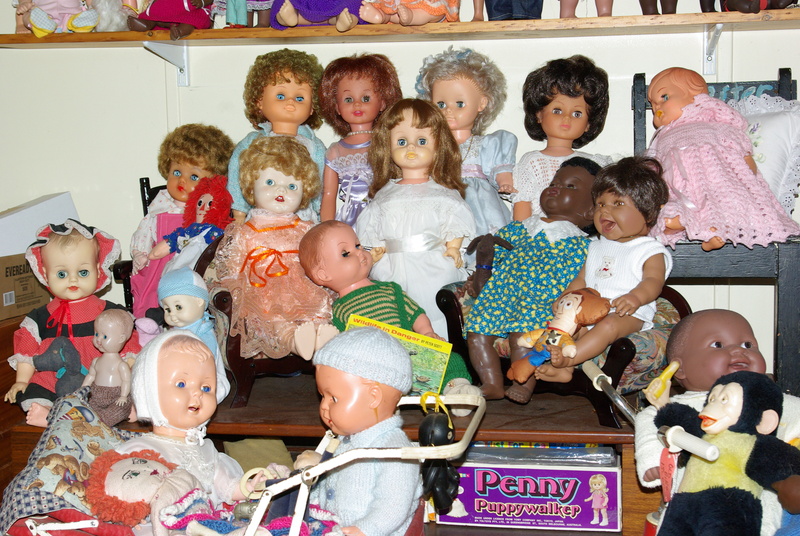 The Tressy’s, who are the most outspoken members of my vintage doll collection made three wishes for Christmas. 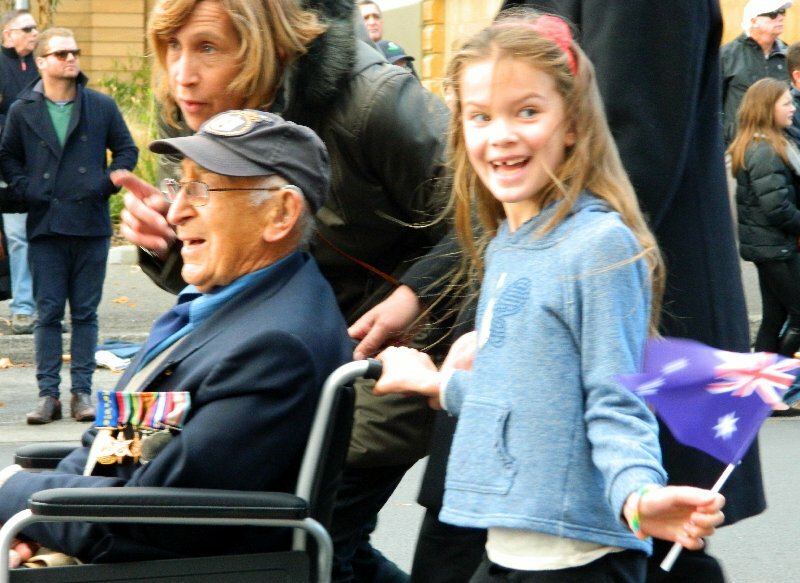 They wanted makeovers, new clothes and to meet some men. So when I was given some vintage clothing as part of my Christmas present they were given first pick. My sister had included the clothing with my Christmas Barbie and the outfits were a mixture of home-made and generic. 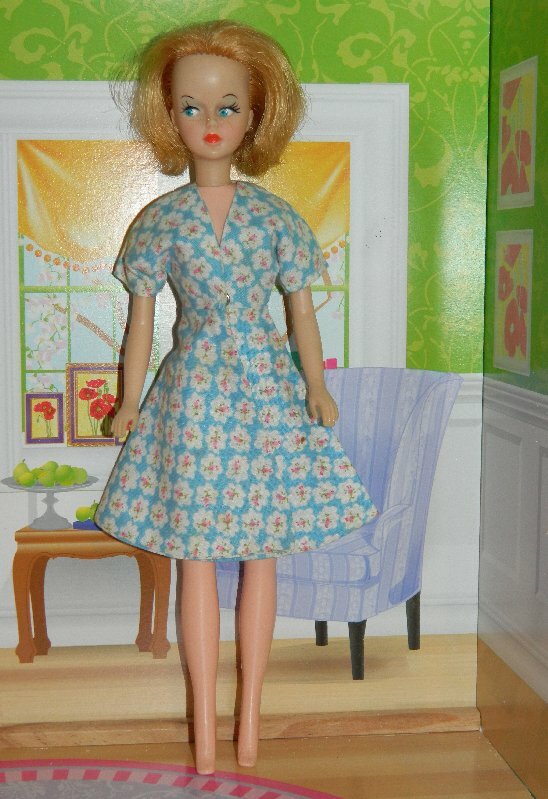 I didn’t get around to trying it on any of the dolls until now and I found that some things fitted the Tressy’s quite well while others were a better fit on the Tammy’s. One little skirt was so tight that it didn’t fit anyone so I might let Skipper try it on later. The Tressy’s have been quite jealous of all the Barbie fashion posts I’ve done and wanted to remind me that they too were Fashion Dolls; so here they are modelling their new (to them) outfits. First of all here is my childhood Tressy made by the English company Palitoy under licence for American Character. Tressy actually was not making as much fuss as the other two because she is the proud owner of my only genuine Tressy outfit. However, you can’t wear your party dress all the time so she has this little outfit for summer. It is all home-made and although the top is rather large it looks nice tucked into the skirt. I remember being forced to make a skirt just like this for myself in primary (elementary) school and my hatred of red and white check gingham lasted for many years after that. I was very bad at sewing and teachers tended to shout at me. Tressy says she feels like she is going to a square dance. 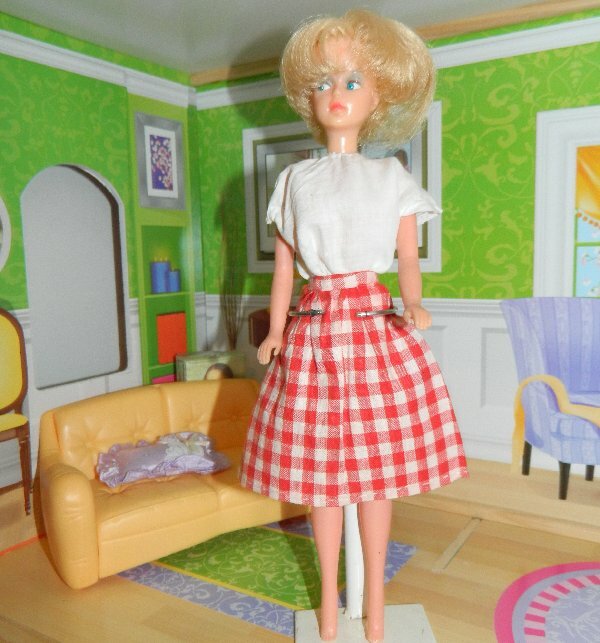 English Palitoy Tressy wears a home-made gingham skirt and cotton top. 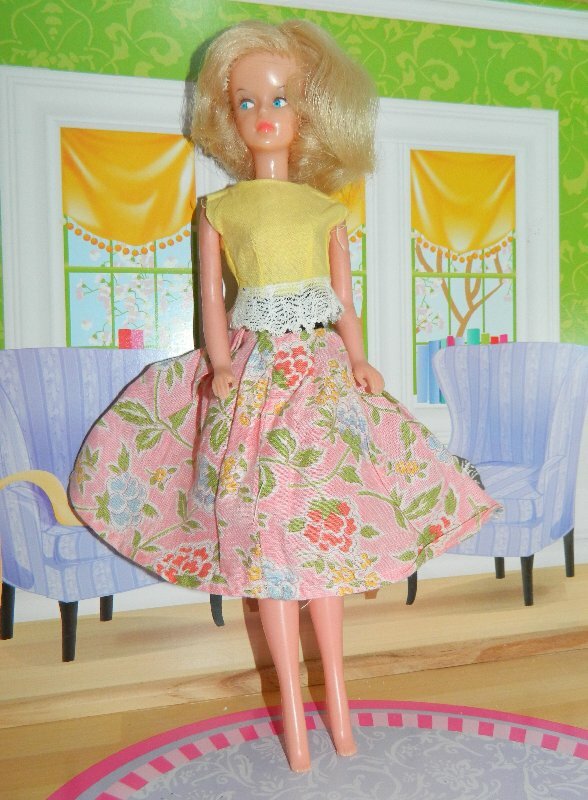 Our next model is American Character Tressy who is wearing a summery outfit consisting of a home-made pink floral skirt and a lemon yellow top which I believe is factory made but is untagged. I actually received two of these tops, this one is in slightly better condition. I think AC Tressy has the best hair of the three of them. AC Tressy in home-made vintage floral skirt and untagged yellow top. Last of all is V-Leg Tressy, also by American Character. She is wearing a blue print wrap front dress which is also untagged. It looks as if it should really have had a belt but I don’t know if it ever did. This Tressy came to me with an unfortunate hair cut and although I’ve tidied her up a bit she could still use some improvement. Or I may need to make her a hat. V Leg Tressy wears a blue cotton print dress. If you read my Christmas posts you will know that the Tressy’s did meet some men at the Tammy family Christmas party and as a result they have decided to be more sociable instead of staying upstairs all the time complaining about Marissa. They have another wish now though. They want some shoes. Tressy’s can’t wear Barbie shoes, their feet are a bit larger. I learned this many years ago trying my cousin’s Barbie outfits on Tressy. I also need to buy some proper Kaiser doll stands not only for the Tressy’s but for a lot of the dolls as they are constantly falling over so that’s going to be a big part of my 2015 doll budget. Next post I’ll show you what the Tammy’s got to wear. For two or threeyears at that school I had to do sewing and they always supplied us with quarter inch check gingham for our projects.I quite like the material now and red is my favourite colour but I hated those sewing lessons. It also irked me that only the girls had to do it. They must have gotten a good price for it. The inexpensive fabric one was supposed to practice on was an unbleached muslin. One couldn’t wear anything made from it. It seemed like such a waste of work. 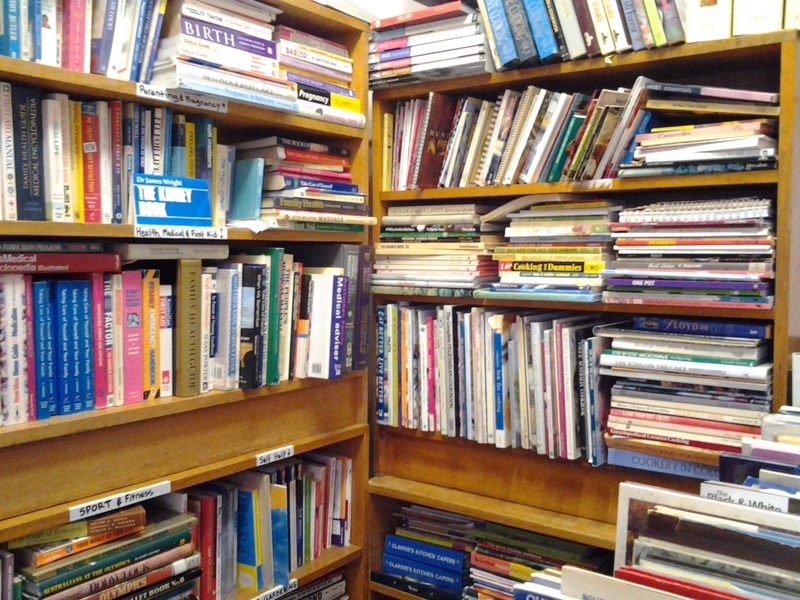 In our school boys had “shop” and made things from wood like book ends. The amounts they were buying with about 20 girls to a class they probably did get a good price. They also wanted us to learn to do cross stitch on the checks. In high school the boys were offered a choice of woodwork or metal work. Some girls asked if they could do that too and were told “No. You are doing domestic science.” No wonder I left school at 15. They did let me take mechanical drawing with the boys. All those boys and me. It was great. I became very good at block lettering. The flower print on the blur dress is fantastic. I think that looks very 60’s. The dress of V leg Tressy looks very cute. I would give it a belt to hide the snap. The gender oriented dividing of girls and boys was still going on in my school days, at least for a couple of years. We were among the first girls, who were allowed to chose between domestic science and shop after the first year and I picked shop back then. Our domestic science was called textile design, which didn’t make it more interesting to me in those years. I learned sewing from my mom and her seamstress and I think I learned much more from them, than in school. That gender oriented dividing was crap, There are as many boys who like knitting or sewing, as there are girls who love building or fixing things. I could not agree more. Many men are chefs after all but when I was a teen boys were not encouraged to learn to cook at school either. I’m glad times have changed.